Mascara can be one of the trickiest pieces of make-up to get right, and No 7 have developed a new mascara to try and combat the usual problems, such as clumps and lumps, with the No7 Lash Adapt Mascara. Available in two shades, black and brown/black, No 7 Lash Adapt Mascara is one which can be adapted to suit the occasion, whether it be for work or a night out. The beauty of this mascara, is that you can add up to 6 coats, to create a more dramatic look, without causing any unsightly lumps. No7 Lash Adapt Mascara contains Jojoba Oil, which is known to keep condition and moisture, so there is less chance of your eyelashes becoming brittle. This oil will make your eyelashes soft, shiny and flexible. If you want to be the centre of attention, this mascara will be sure to do this, as it accentuates your eyes and draws attention to them. The fact that it is so versatile, means you can carry it around with you everywhere and use it for any occasion, whether it be for a meeting at work, a night out with the girls or even a trip to the shops. The unique formula gives you more control of your eyelashes, so you can change them to suit the look you want. If you want less clogging, and more defined eyelashes, then the No7 Lash Adapt Mascara is the perfect choice. We can sometimes get carried away with the amount of coats of mascara we put on our eyelashes, but with this one, that is not a problem. You can put on as many as you desire, to get a look you are completely happy with. 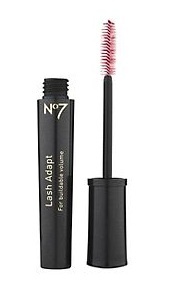 No7 Lash Adapt Mascara is available from Boots, at a cost of £12.50.